Most scholars and fieldworkers have reported that Belauans today have very little interest in the monolithic stone carvings and that, in the opinions of many islanders, foreigners surely must have carved them. The experience we had with the Belau Monolithic Sculpture Project in 1987, however, told us something quite different. 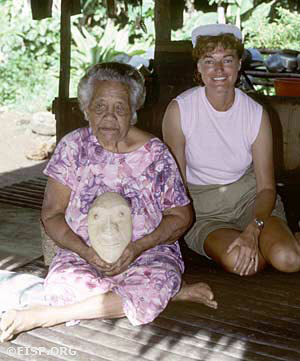 We found that many Belauans had a profound interest in the carvings as a valued part of their cultural heritage. We were also convinced that some of the carvings were still valued as sacred objects in several of the more remote villages.